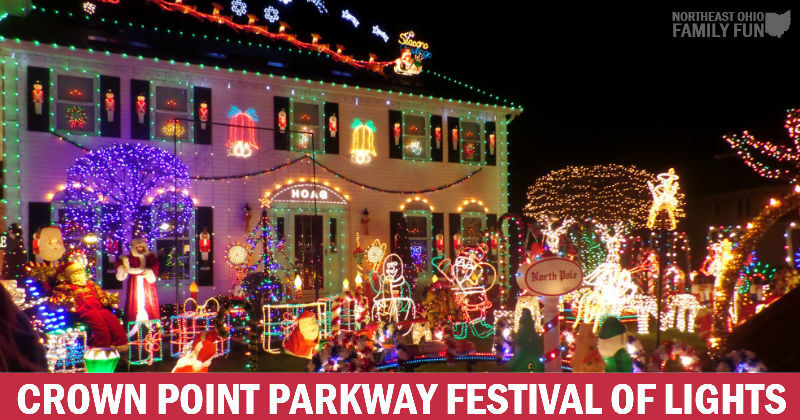 The Crown Point Parkway Festival of Lights is one of the most beloved Christmas Light Displays in Northeast Ohio. 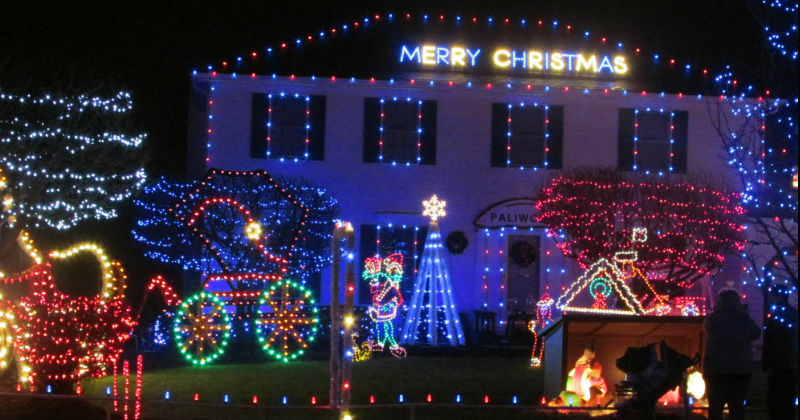 The display, which was featured on ABCs Great Christmas Light Fight in 2015 and while it didn't win, it's definitely a fan favorite for everyone who lives in the area. 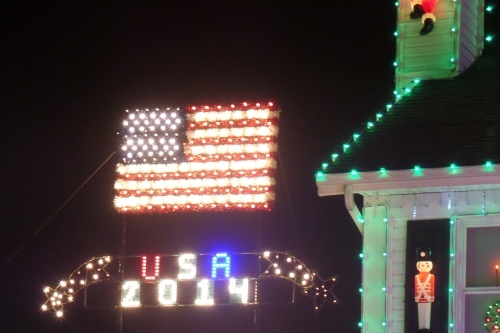 Ever since learning about the display, each year we make the 45 minute drive to see the the lights in person. We all agreed that the experience was well worth the drive. I hope you enjoy the pictures and if you are with-in driving distance of Strongsville, you will want to make the trip out to see it this year. And keep your eyes peels because you may just spot Dan Hoag, the creator of the display walking around among the spectators making sure all the lights are burning brightly! As soon as you pull onto Crown Point Parkway you will immediately see the glow of Christmas Lights in the distance. You'll likely encounter a crowd of people and steady stream of cars (especially if you come during the weekends). To fully enjoy the experience, park your car on Bennington Dr. and get out and walk around the sidewalk under the lighted archways. 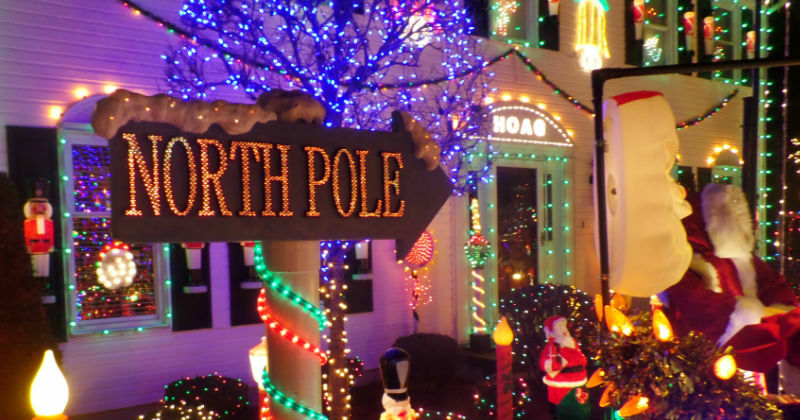 Nine of the eleven houses on the cul-de-sac decorate for Christmas so you will enjoy many lights as you make your way to the centerpiece of the display, the Hoag house. Dan has been hosting the display since 1988 and each year it has gotten bigger and better. Each year he takes the display to a whole new level adding more and more components. You can't help but be amazed as you take it all in. I asked Dan about his favorite aspects of the display and he mentioned the nativity scene and the two running trains located in his front yard and the large American Flag that sits high in the sky above the garage. I was most impressed with the clean look of all the lights and displays. Everything is meticulously done with extreme precision, it is obvious that Dan takes extreme pride in creating his one of a kind display. The kids really enjoyed getting able to talk and get their pictures taken with Santa. He even gave them each a candy cane. Excited to see the display? Then you will definitely grab your car keys once you watch the video below. Of course the pictures and video still don't due justice to the feel of seeing the display in person. So if you're in the Strongsville area plan your trip before the end of the year. 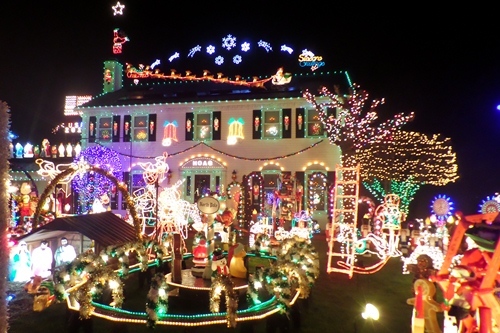 Approximately 32,500 lights adorn just one of the homes, and the 30 moving decorations include trains and a merry-go-round. 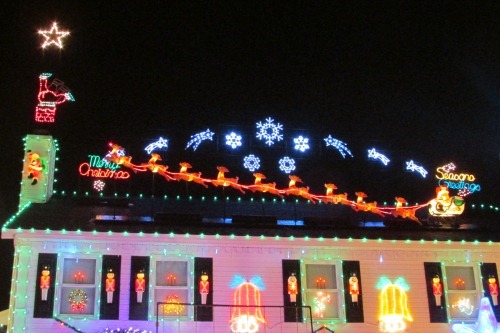 Santa Claus is there from 6:30pm – 9:30pm on Fridays and Saturdays. You can drive or walk around the display, but I highly recommending walking. Viewing Instructions: 9 out of the 11 houses in the cul-de-sac participate, so my recommendation is to park on Bennington Dr. and take your time walking around the entire cul-de-sac. The road intersects with Crown Point Parkway (where the display is), if you park there you can walk the sidewalk to see the display. I hope that helps! Until what date they will be open? Are we able to see display on Sunday’s? I saw this on TV and Facebook and just had to go see it. Wow truly amazing. Just as we pulled down the street it started to snow a little tonight. This just made it more awesome. I loved it. What a truly amazing job all the neighbors do. Loved it. I was not in the holiday spirit due to several issues but this helped me. Thank you. Merry Christmas to all of you. I’m slightly disabled , can I drive down the street to see the lights or do I have to walk? thank you..
You can drive down, there are plenty of cars that do. Enjoy the lights! I grew up on Bennington I remember walking this as a child and have gone every year almost since we moved 19 years ago and so excited to take my DTR there and show her what I did and saw as a child 🙂 beautiful really!! !